Materialism, he goes on, neglects the unseen dimension and serves to keep us distracted and unaware of the Transcendent. 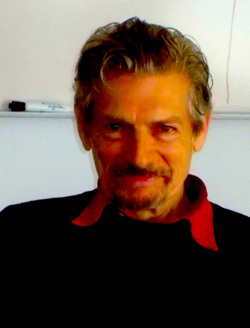 Now an independent scholar, writer, and painter, Grosso, (below) a resident of Charlottesville, Virginia, received his Ph.D. in philosophy from Columbia University in 1971. He has taught humanities and philosophy at Marymount Manhattan College, City University of New York, and New Jersey City University and is affiliated with the Division of Perceptual Studies at the University of Virginia. He has authored five other books, including The Man Who Could Fly and Wings of Ecstasy: Domenico Bernini’s Vita of St. Joseph of Copertino, both published last year. I recently interviewed Grosso for the October issue of The Searchlight, a publication of The Academy for Spiritual and Consciousness Studies, Inc. (http://www.ascsi.org/) and now post it here. What prompted your interest in things paranormal and/or spiritual? Well, the two are closely linked. I think in my case your question is easily answered – in a word, experience. I was a boy when my mother described what later I would call a “crisis apparition” of her brother at the time of his death. I also recall a story about a ghost in the family lore who made herself known by nicking the odd handkerchief and folding it into an intricate, complex pattern. I witnessed the impact on my older brother of an unexplained fragrance he ultimately connected with Padre Pio. Meanwhile, from my early years until the present, I have myself had direct experience of many kinds of paranormal experience—sporadically. I have also made it my business to meet reseachers and experiencers, and read widely in the literature. All this has helped to make me receptive to ideas that are treated as suspect in the mainstream, dominant materialist culture. Would you mind summarizing your worldview now, especially with regard to survival and the meaning of life? Has your worldview changed over the years? As for survival of consciousness and the meaning of life, I would say this. There are rational reasons to support the belief in survival; most compelling is to have direct experience—as, for example, the near-death or mystical experience. Despite what I know and have experienced, I agree with Plato that belief in an afterlife is kalos kundinos—a noble risk. As for the meaning of life, that is purely a personal matter; each of us finds, follows, creates our own meaning: aims, ideals, virtues. Each of us is forced to create our own ship of meaning from the raw materials of our experience. My worldview has evolved in the sense that philosophical and empirical events have led me to an interesting speculative conclusion: when we try to assemble all the supernormal powers into a coherent picture of human potential, it looks as though the next possible stage of human evolution is toward the appearance of a new human species that resembles ancient Greek gods and goddesses. You said you have had some direct experiences of your own? Would you mind summarizing the most significant ones and your conclusions regarding them? In 1971, I (with two other people) witnessed a UFO from my sixth-floor window in Greenwich Village while we were listening to John Coltrane’s “The Father, the Son and the Holy Ghost.” The UFO then flew to the dome of Our Lady of Pompei just down the block, and beamed at us—then took off and vanished over the Empire State Building. In 1981, I had three detailed dreams in a row of President Reagan being shot—two weeks before he was shot (having shared the dreams in advance with my class). In the early 1990s, in a group setting, I successfully conducted a levitation experiment with a two hundred pound ex-marine. The joint effect of just these three incidents was enough to explode my established ideas about terrestrial life, time, and gravity—a good start, I’d say, for a metaphysical breakthrough. The meaning of my life is in part based on trying to figure out what all my strange encounters signify. I am convinced almost all mainline views of reality, scientific or religious, are only partly correct – the big picture and what is all means remains for me an engaging mystery. I think life would be horrible if we had it all figured out. In your 1985 book, you wrote that people were at an all-time low as far as inner sources for coping with disaster and mortality. Do you think any progress has been made over the past 33 years? Why or why not? I really don’t know how to answer that. Those were grim times in 1985 with the nuclear sword of Damocles hanging over us, but they seem even grimmer now with a pathological liar leading the most powerful nation in history. We may not be better equipped today with inner resources but I do believe that in moving toward social, climate, and nuclear catastrophe there may be an increase of psychic and spiritual awakenings, possibly en masse—the species mind awakening as does the individual when confronting death or even the heightened risk of death. When psychical research changed to parapsychology during the 1930s, researchers pretty much divorced themselves from mediumship and the whole idea of spirits. Parapsychologists still seem to avoid those subjects. Aren’t researchers just reinventing the wheel over and over again with such an approach? To put it another way, how can you arrive at a spirit world without hypothesizing spirits in the first place? In my view, the basic claims for the reality of psi have been established and we should go beyond just trying to prove the stuff is real. Let the research take us to the outermost limits of the possible, to survival after death and the immortality in life. I believe we’ve barely begun to explore ways of emancipating human sensibility and agency. Many parapsychologists accept the reality of psi, but remain skeptical or non-believers in survival. Do you think a career in parapsychology can be meaningful without some degree of acceptance of survival? Or, to what end is a belief in psi along helping humankind? Is there such a thing as a career in parapsychology? I think it may one day happen that everybody will believe in survival, perhaps after a new technology makes us all clairvoyant seers. Until that happens there will be differences of opinion on this and all matters of great importance. Progress is to explore all sorts of ways to awaken and exploit our otherwise neglected psychic abilities—for health, for the creative arts, for community—and for the sheer adventure of exploration. Parapsychology should not be confused with normal science; maybe that’s part of its appeal. Curious you should mention Medjugorje, I’m half way through a new book on the subject by Daniel Maria Klimek. Klimek points out that scientists studied the ecstatics during their actual encounters with the appearance of “Mary,” perhaps a first in the history of science. The results, according to their data, prove that none of the visionaries showed any sign of pathology. They also seemed focused on one external reality—what that reality is remains unknown. Regarding these appearances, I find of great interest what seems like signs of the return of the goddess, an unconscious revolt against the repression of the feminine. The UFO visitors I saw seemed to be dancing with Trane’s music and on to the Dome of Our Lady! Uncanny connections that leave me clueless. Considering that the scientific studies of the ecstatics, or visionaries, suggest no fraud or deception on their part, do you think it is actually the Blessed Virgin Mary communicating with them over the past 37 years? Whether the appearances of the alleged Virgin are of the actual mother of the historical Jesus, it’s impossible to know, and even Klimek states that is a matter of faith. I myself don’t believe it. If I was one of the visionaries I might. In my review – accepted by the Journal of Religious Studies – but not yet submitted – I focus on the scientific discussions (ignore all the theology), and play up the critique of reductive materialism and the critique of constructionist theories of mysticism. All that is solid stuff – and I’m happy to admit there are features of the phenomena that are genuine scientific mysteries. I think I’ve done the book justice without committing myself to anything I don’t believe in. You said earlier that it would be horrible if we had it all figured out. I take that to mean that “absolute certainty” of the survival of consciousness is not something we should have or even desire. Would you mind elaborating on that? This question is very interesting. Let my try to answer. First off, is absolute certainty of survival possible? What comes to mind are near-death experiences; here, the absolute certainty results from the belief that one has died and consciously entered into a postmortem world. But you don’t have to be near-death to have what might seem like self-certifying encounters with another world. Being physically assaulted by a ghost in a haunted house, which I experienced, is a case in point. No facile arguments can dislodge the certainty of my experience. Direct experience of one or another sort is one way to achieve at least a robust certainty. But other routes also exist. For example, by comparative study of all the relevant data, some might reasonably infer that survival was a fact of nature, and in a manner virtually certain. This would be so, theoretically. Needless to say, the theory needs to be tested before wholly certified. But now for your second question. Is absolute certainty desirable? Doubt it. Back to Plato’s comment that immortality was kalos kyndinos—a “noble risk.” It is not our highest concern. Speaking for myself, I don’t crave absolute certainty about anything. In all the big questions, of God, of love, of immortality – of how to live – there is always uncertainty, unpredictability – the risk intrinsic to just being. The Final Choice: Death or Transcendence by Michael Grosso is published by White Crow books. *This book was originally published under the title, The Final Choice: Playing the Survival Game. Thanks for the comment. I am not familiar with the Star Trek series, but it certainly appears we are in the “end times,” however they may play out Recreational pot and late-term abortions seem to be the latest indicators of the hedonism moving us in that direction. I can only hope that the crisis we are facing will push us toward a desperately-needed spiritual awakening. That’s the most hopeful view of the situation I’ve encountered. The fundamental story of the Star Trek universe posits that humanity hit a crisis point, somewhere around our time, and survived to exist at a much more enlightened level. I’ve always hoped that Gene Roddenberry was correct about that. The current Star Trek series, Discovery, is focused on questions of science vs. faith, mysticism vs. materialism. It includes a mysterious being called the Red Angel, which shows up in various times and places and saves people from disaster. We don’t know yet what the writers intend with this, but it has reminded me of an apparition I encountered a couple of times years ago, which I thought of as the Blue Lady. I’ve gotten to wondering if she might be a manifestation of the same being or phenomenon which creates the Blessed Mother sightings. I agree with Michael, many/most parapsychologists simply don’t believe in the possibility of survival after death as it seems to be “unscientific” to hold such belief and even worse to investigate on it. This is close-mindedness on steroids, but it is how the world we live in operates. Moreover, parapsychologists already feel over-scrutinized and looked at with suspicion by their scientific colleagues, the majority of whom neither believe in telepathy, remote viewing, etc. This puts additional pressure on parapsychologists to prove their true allegiance to science, which often can be conflated with allegiance to scientism. So it really is not strange to find many researchers on psi abilities whose worldview is even more materialist than the average scientist’s worldview. Also, an important issue is funding. There’s no money to research matters related to life after death, so it makes virtually impossible for non-materialist parapsychologists to proceed with their investigations on survival. It’s that simple. This is from the Institute Windbridge’s website (a private endeavour founded by scientist Julie Beischel to test and certify mediums and explore the potential of mediumship on issues like dealing with bereavement and others): “Unfortunately, funding sources for activities related to topics like life after death and after-death communication are few and far between”. This situation isn’t going to change any time soon. Contrary to many people’s views, I think we are witnessing a consolidation of materialism. We are shifting from a materialist worldview to an ultra-materialist one, imho. Sooner than later, we are going to face extremely challenging times related to climate change, energy sources and demographics among others. This will push people further on the way of materialist thinking, since ‘survival’ will mean how to ensure your family’s daily bread and shelter in a highly convulse, unpredictable and growingly hostile environment. To sum it up, we (the privileged brethren of first-world countries) are about to be abruptly transferred from an ultra-hedonistic society where, say, joyful materialism precludes the awakening to spiritual matters, to a post-hedonistic crumbling society where such awakening will be precluded by a survival-mode, daily-bread-seeking bitter materialism. Fortunately, I may be wrong. It’s not a matter of the researchers not accepting Spiritualism but a matter of why they gave up on mediumship. The “Margery” (Mina Crandon) and George Valiantine mediumships of the late 1920s pretty much discouraged a number of researchers, including Drs. Rhine and McDougall, from further pursuing research involving mediums. The problem was that you have to hypothesize spirits to arrive at spirits and that was not “scientific.” Thus, they could only conclude that the mysterious activity they observed was some kind of trickery on the part of Margery and Valiantine rather than the action of spirits. How could spirits have caused it if there is no evidence of spirits? Parapsychology became focused on finding evidence for telepathy, PK, remote viewing, etc., and avoided the mention of consciousness surviving death and communicating with people still incarnate. It was unscientific to discuss survival and spirits. It is not something stated in a paragraph or two in any reference that I know of. It is something that can be inferred from reading the research and seems to be verified by surveys of various parapsychologists relating to their beliefs. The last one I saw, a few years ago, indicated that about two thirds of parapsychologists do not believe in survival, but I can’t immediately find that reference. The fact that we are on the brink of self-destruction, thanks in no small measure to the pathological characters in leadership positions (and that’s no accident of fate), indeed contributes to our accelerated emotional and spiritual development—the shedding of our false self, individual and collective, and the emergence of the True Self. This is a process of positive disintegration on a mass scale, affecting each of us in different ways, depending on our level of development. Thanks again. I very much look forward to reading Michael’s books. Mike great interview per usual! Where could I find a description of why the parapsychologists didn’t accept Spiritualism and why? Interesting and commendable that Michael Grosso doesn’t believe in certainty about anything. That attitude is of course that favoured as pristine or “solid” science. This is because something may have happened one demonstrated way a thousand times etc. - but that doesn’t mean that the next time the experiment is carried out, it will necessarily give the same result. There is also the concept that consciousness itself creates reality. So, individually and collectively we all have a chance to influence what we then perceive. This may suggest in part why some paranormal events may occur or be triggered, i.e. low probability sporadic chance events initiated by individual or collective thoughts of sufficient intensity. Like Grosso, I too have experienced a ghost in full daylight, but also in my case followed by intermittent ringing of the doorbell and smoke alarm for a few days following a death next door. A comforting thanks for assisting in unsuccessful resuscitation perhaps?